Anisyutkin, L. N. 2003. Contribution to knowledge of the cockroach subfamilies Paranauphoetinae (stat. n.), Perisphaeriinae and Panesthiinae (Dictyoptera: Blaberidae). Zoosystematica Rossica 12(1): 55-77. Grandcolas, P. 1993. Monophylie et structure phylogenetique des (Blaberinae + Zetoborinae + Gyninae + Diplopterinae) (Dictyoptera: Blaberidae). Annales de la Société Entomologique de France 29(2):195-221. Grandcolas, P. 1998. The evolutionary interplay of social behavior, resource use and anti-predator behavior in Zetoborinae plus Blaberinae plus Gyninae plus Diplopterinae cockroaches: A phylogenetic analysis. Cladistics 14(2):117-127. Maekawa, K., N. Lo, H. A. Rose, and T. Matsumoto. 2003. 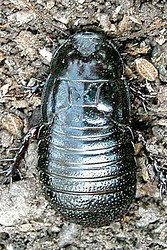 The evolution of soil-burrowing cockroaches (Blattaria: Blaberidae) from wood-burrowing ancestors following an invasion of the latter from Asia into Australia. Proceedings of the Royal Society Biological Sciences Series B 270(1521): 1301-1307. McKittrick, F. A. 1964. Evolutionary study of cockroaches. Cornell University Agricultural Experiment Station Memoirs 389:1-197. Roth, L. M. 1981. The mother-offspring relationship of some blaberid cockroaches (Dictyoptera: Blattaria: Blaberidae). Proceedings of the Entomological Society of Washington 83:390-398. Roth, L. M. 1981. 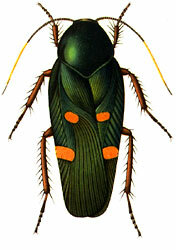 The non-Australian species of 'Calolampra' (Dictyoptera, Blattaria: Blaberidae). Entomologica Scandinavica 12(4):405-425. Roth, L. M. 1991. 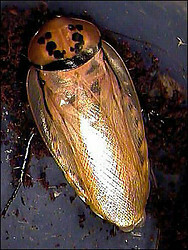 Blattodea, Blattaria (cockroaches). Pages 320-329 in Insects of Australia: A Textbook for Students and Research Workers. Volume I. Second Edition. I. D. Naumann, P. B. Carne, J. F. Lawrence, E. S. Nielsen, J. P. Spradberry, R. W. Taylor, M. J. Whitten and M. J. Littlejohn eds. Carlton, Victoria, Melbourne University Press. Roth, L. M. 1994. Cockroaches from Guana Island, British West Indies (Blattaria: Blattellidae: Blaberidae). Psyche 101:45-52. Roth, L. M. 1995. Africalolampra ehrmanni new genus and species, and the male of Paraplecta parva Princis (Blattaria: Blaberidae). Psyche 102(1-2):89-98. Roth, L. M. and C. Rivault. 2002. Cockroaches from some islands in the Indian Ocean: La Reunion, Comoro, and Seychelles (Dictyoptera: Blattaria). Transactions of the American Entomological Society 128(1):43-74. Blaberidae of Brisbane, Australia. Brisbane Spiders and Insects.